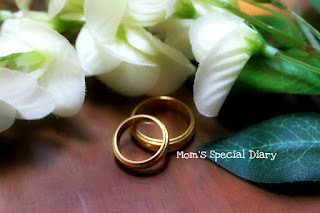 Mom's Diary: Hubby and I marked our 9th year of married life. Hubby and I marked our 9th year of married life. I feel like I've gotten ahead of myself hmm. There are a few details I haven't told you about, like how I met my husband and how we got married. Those are some of my happiest moments that I would like to share with you guys. I first met my husband in the Philippines but moving to Yamanashi ten years ago was the best decision I’ve ever done. He was my boss and a former owner of Production Company. He was shy, serious and a lil mysterious type of guy, I was working under he’s owned company. While I was working here abroad I feel so sad and I guess any person living abroad will feel the same. “homesick”. That time I was crying and hoping that he can send me back home even with or without my two month salary. But he refused to; instead he did everything to make me feel happy. From there we became friends and he started calling me four to five times a week. I have to be honest I didn't give my husband much thought at first. I was in a long-distance relationship and was just looking for a friend to hang out with and talk with occasionally. About a month later, hubby was trying he’s best to get my attention he literally asking me out for a coffee, If I didn't know him better I probably should have thought he was stalking me LOL ! As they say surviving long distance relationships can be difficult. I believe it’s true; I had just gotten out of my long distance relationship. My husband and my fellow co workers /housemates helped me to move on so I fall in with the crowd quickly; and from there Mr. Shy guy and I were dating. Our first date was really funny. He took me to Shinjiku Tokyo to watch the fantastic show and then we went to Gunma ken to visit my cousins. I still don't know if he was trying to impress me or he was just polite to introduce himself. Fast forward Year 2000 was the year I got engaged, On February 2000, I had to leave my work for good because I feel that maybe I was pregnant. I was in the Philippines when I found out that my suspicion was true. After some series of test my Obstetrics Gynecology told me that I am pregnant. That day I called my husband to announce the good news. I was in tears while telling him (Congratulations you're going to be a Dad!). My husband was thinking of me that day he was excited he called me and told me that we should get married in June that’s why four months after I told him the good news we got married..
Hubby and I recently marked our 9th year of married life. We celebrated our 9th year wedding anniversary two days ago (yup, wonderful 9th years together. Being with my husband always brings out the best in me. I love you so much. wow..pang telenovela ang love story mo sis...you married to your shy boss..it's just so nice..all along pala while you were working with him, meron na xang tinatagong pagmamahal sau..parang nghihintay lang ng tyempo..Anyway sis, congratulations to a happy married life and 9th year anniversary..! Happy 9th wedding anniversary to you jac and to your hubby. wow 9 long happy beautiful marriage. I wish i can beat that. i hope. Happy Anniversary! Wishing you more happy years to come! Nine years of being married is a tough act to beat. Congratulations to the two of you, and Belated Happy Anniversary! Nice one! Congratulations and good luck!